Ever since I was a little kid, there was something pleasantly hypnotic about a home heated with a freestanding wood-burning stove, something that spoke to me. While I couldn’t verbalize it then, what I later realized was that I liked the direct, physical, easy-to-understand connection between a warm house and the natural world. It was an even greater connection if I had cut, split and stacked the logs myself before loading them into the firebox. Like building something myself rather than buying it, I felt like I was part of the process of heating my home and warming my family, rather than just a consumer of some invisible fuel piped into my house from some unknown source, for which a bill arrived each month. I still like wood-burning stoves, too, and there’s still that tinge of childhood glee when I feel one glowing on a bitter January night. But, there’s something else that plays into my affection now—my utility bill every month. My old house leaks heat like a sieve, and my poor furnace needs a wing-man. I’m not about to throw out my flip-of-a-switch natural gas heat, but with the right stove I’m anticipating warmer nights this winter, something nice to look at in the corner of my living room, and a mercifully lower gas bill. 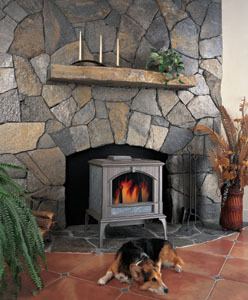 Soapstone is an incredibly dense and beautiful material for wood-burning stoves. The first step to selecting the right stove is to determine what you want it to do—heat the entire house, or just warm a small space. Upon deciding that, part of the decision becomes pretty formulaic, while the rest settles out a little more subjectively. For the formulaic part, product literature and your dealer can lead you to the size stove that’ll do what you want. This narrows the field of contenders considerably and sets you up to dial in the details from there, of which there are several important ones. Soapstone—Soapstone is an incredibly dense and beautiful, natural material with a very high “specific heat” (specific heat is a material’s ability to absorb heat), according to the Woodstock Soapstone Company. The Woodstock Company states that soapstone has twice the heat storage of cast iron and steel, and that enables the stove to not only heat spaces evenly, but to retain its heat like a heat sink long after the fire has cooled. The soapstone camp goes on to say that cast iron and steel stoves, since they hold half the heat of soapstone, radiate (i.e. lose) much of their heat to heat the air in the room, causing abrupt heat-ups and cool downs. Cast Iron—Cast iron stove manufacturers cite their stoves’ abilities to heat up and cool down more quickly as a benefit, which is especially nice in the spring and fall when days are still warm, but nights are chilly. Steve Tate of Quadra-Fire says, “Cast iron is going to heat up and cool down more quickly than soapstone due to its natural properties and is more responsive than soapstone.” And, the point of lighting the fire for me is to warm up, not to wait to warm up. Cast iron stove manufacturers also point out that a well-tended fire and properly adjusted stove can burn nicely through the night when you’re tucked under your blankets, then heat you right up again when it’s time for coffee and eggs. Steel—Steel stoves are a little outside the Ford/Chevy debate, because the steel heats up noticeably quicker than the more dense cast iron and soapstone as well as cools quickly when the fire goes down. 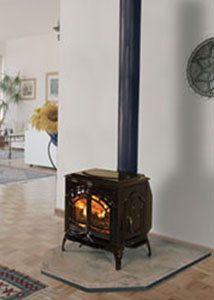 Efficiency Ratings—The EPA and Underwriters Laboratories require strict, scientific testing of wood stoves from which they determine the “efficiency rating” that should be listed in the stove’s spec sheet. Using a very strict definition, catalytic stoves are more efficient and have a cleaner burn than non-catalytic stoves. This is because a filter in catalytic stoves catches minute particulate matter and combusts it. A non-catalytic stove would let this matter pass up the chimney. But these are very small particles, so be careful how you weigh this feature in your decision. EPA efficiency ratings between catalytic and non-catalytic stoves are extremely slim between many models. The EPA mandates that all wood-burning stoves meet certain efficiency ratings, making burning wood a much cleaner and environmentally responsible way to heat, which wasn’t always the case according to the Hearth, Patio, & Barbeque Association (HPBA). Cast iron stoves have the ability to heat up and cool down quickly. How the stove is fed air and how much control you have over the flame intensity is usually more customizable with a non-catalytic unit. This means that you don’t have to burn the fire on high as often. And, you can open the fire box doors for that “fireplace experience” when you want to hear the logs snap. The price of cord wood plays into this, too. A cord of seasoned hardwood where I live in Pennsylvania runs $125-150 per cord, and one cord to a cord and a half can last an entire winter. That price is about half of one gas bill for one winter month for me, so this is another reason to be careful about splitting efficiency-rating hairs. Looks Count Too—Efficiency and proper sizing are important, but the last thing I want in my living room is a really efficient hunk of pig iron. 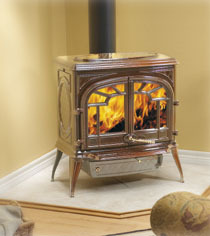 So (to keep the truck metaphor cookin’) check out the trim packages stove manufacturers offer. From basic black to eye-popping enamel finishes and nearly Victorian detail, there’s a wide palette to choose from. And, as with a new truck, features cost cash. Basic black cast iron and steel are just that. They have sleek, simple lines and may be your taste, but for a different (and more expensive) look check out the finely detailed models that look like they were cast in a bygone era. Look for enamel finishes too. They can help the stove blend in to your décor—or make it pop as a central feature. Reds are typically the most expensive enamels. However, all enamels may chip over time and are tough to repair according to Neil Sklaroff of Ambler Fireplace and Patio in Colmar, Pennsylvania, who helped me choose the stove that worked best for my house: a Quadra-Fire Cumberland Gap cast-iron model.